2. Alameda County Supervisors approved a lengthy list of reforms to Urban Shield, the controversial annual law enforcement disaster training event, the East Bay Citizen reports. 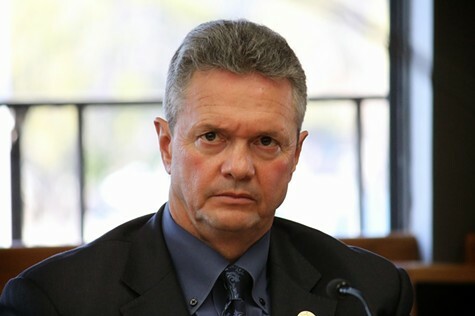 But the future of the event and vendor show remains in doubt as Alameda County Sheriff Gregory Ahern maintains some of the recommendations violate terms of the $5.5 million federal grant, and therefore, means the loss of funding. 3. Gov. Gavin Newsom is effectively ending the death penalty in California after announcing a moratorium that will take 737 prisoners off death row, NPR reports. Newsom's executive order will also close the execution chamber at San Quentin Prison. 4. Berkeley, like many East Bay cities, has historically used zoning codes to segregate white, wealthy neighborhood from the poor and minorities. Jesse Barber in Berkeleyside takes a look at a series of proposals coming later this month to the Berkeley City Council that could bring density and affordable housing to some of these once exclusive neighborhoods. 5. Numerous studies and surveys find a large number of college students identify as homeless. A bill introduced in the Assembly would allow students to use campus parking lots to sleep in their cars, according to the California Health Report. 6. Coliseum Joint Powers Authority boardmembers will vote this Friday morning on a one-year lease agreement for the Raiders to play the 2019 season in Oakland, the Associated Press reports. The on-again-off-again-on-again deal is worth $7.5 million for this year with a $10.5 million option for 2020. 7. St. Mary's became the Bay Area's first and likely only school to qualify for the NCAA Tournament after upsetting Gonzaga, the top-ranked men's basketball team in the nation, in the West Coast Conference tournament final, CBS Sports reports. March Madness begins Mar. 21. Fill out those brackets!